Gone are the days when you listen to the chirping and tweeting sound of the little birds on early mornings and evenings in your garden and balconies. But now you only listen to the honking of cars and motorbikes or the sound of air conditioners and coolers. I remember the days when I used to see sparrows playing and jumping from one stem to another, lying in the mud to cool their bodies on hot summer days, hiding in a searched shelter or on a tree in heavy rains. Most of my time in vacations, I pass seeing the parrots and sparrows flying and sitting on terraces and balconies. Their freedom to go anywhere anytime made me jealous and I also wanted to fly like a bird in the high sky. Remember, some 9-10 years back when you used to go on a morning walk few little birds giving you company and singing beautiful songs for you which made the atmosphere more beautiful and musical. But now they all are silent because only a few are left in metropolitans like Delhi and so many of them have lost their friends. I remember in monsoon many of them sat in my balcony fluttering their wings to shed down the rain water, it seems like they were feeling cold. They used to make their nest on my balcony and on trees opposite my house, lay eggs and watch it the whole day flying from here to there, sitting on the wall to wire to grill and keep a watch on their nest. Sometimes fast winds broke their nest and eggs, they look at broken eggs for some time she felt bad and make sounds chi-chi-chi like they were crying. Goraiya, the little sweeties in countless poetries, lyrics, songs and folk songs and paintings, is today facing a crisis for survival. It’s been long that we miss the “chi-chi-chi-chi” of Goraiyas or little sparrows every morning and lovely sight of them dancing around. When they were abundant around us at times, we got irritated of the chirping sound “chi-chi-chi-chi” of Goraiyas outside our houses or in verandahs and gardens. But now most of us miss it actually. Universally familiar in appearance, once in abundance the common house sparrow has become a mystery bird and is becoming increasingly rare all over the world. If proper measures are not taken on time, then we might lose it totally or it might be added to the list of many extinct birds and animals. 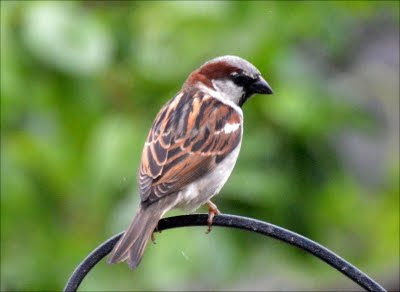 The tiny sparrow is perhaps the earliest bird we can remember from our childhood which is diminishing now. 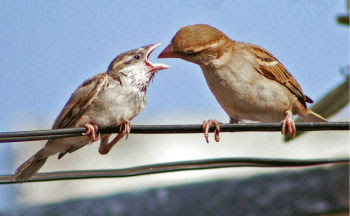 Their petite nests in almost every house in colonies as well as in public places like railway stations and bus stands. They survived on food grains, tiny worms, and leftovers from houses which people give to feed them. Unfortunately, this tiny neighbor is disappearing now. The reasons behind this are many and we the human community is somehow responsible for it. The combustion from petrol vehicles which produces compounds which are highly toxic for small insects, which are a major part of young sparrow’s diet. The lack of nesting sites in modern buildings, radiating waves from mobile towers and increasing pollution are some of the causes for their decrease in population. Today I miss the chirrups, swinging and hopping from branch to branch on trees and balcony to balcony in colonies of little birdies and remember a story I read when I was in Grade 1 or 2 in which a sparrow feed her children and teach them how to fly. The modernization and advancement in our society have taken away almost the whole natural beauty and environment and everything is artificial or man-made in big cities.